Moving this here to avoid further hijacking of the flooded market thread. Caution: Next Level nerding-out here. Clarification #2: I am not talking about e-foils, where a motor is attached near the wings, allowing you to foil without waves. From what I've heard, those are super heavy and not capable of surfing; so a flat water gimmick. I am focused on maximizing effectiveness of foil surfing. Scenario: surfing last weekend an old guy cruised by me on a long board without paddling. He had an electric motor on the bottom and was riding back out on his belly to avoid paddling, as a session extender. I'd think the motor on bottom would have a lot of drag but he was able to surf the waves -- though soft foil type waves, not fast down the line stuff. He got maybe 1.5 hours in, I assume until battery ran out. He said he got the motor 3 years ago in San Diego, built by South African company. Cost him $5k (ouch). I think it runs with internal props, like for motorized hobby boats, not with jets. Possibilities: It got me thinking that having this kind of motor attached to a foil board could potentially allow you to catch a wave without paddling. Then, once you pop up on foil, the motor is out of the water, so no drag. This could allow for smaller boards that are otherwise not easily paddled (e.g., prone foil but with SUP foil range). It could also allow for getting into waves that are not paddle-able (e.g., tow-in unbreaking waves, or downwinders). Gear: the price tag is obviously prohibitive. Some googling shows there are a whole bunch of super expensive jet surf models out there now. You could easily stick on a foil and have this working tomorrow ... I bet it would work. There's these "cheapies" ($400-600) on ebay/alibaba ... but max speed 5mph, would that be enough to allow you to take off on a wave? Or if not, maybe it's just way to get more waves in a session when you have that 300m paddle back. Then there's these motorized hobby boat DIY accessories....motor $100, build your own battery assembly, remote control, etc. There's the outcome of an hour of google time. Anyone heard of people trying this? Thoughts on if it would work? This crazy idea that my friends all laughed at me about appears to now be reality. Probably early days, and I bet that motor is $$$, but has potential to be pretty useful. "Thanks jimmy Lewis for letting me fulfill my dreams electric foil board with wave jet motor pod designed to catch the wave early pump up and foil with out the drag of the motor like other electric foils this thing is sick thanks again jimmy couldn't have done it with out your help @gofoil @gofoil.jp @jimmylewisboards@adventuresportsmaui"
Scenario: surfing last weekend an old guy cruised by me on a long board without paddling. He had an electric motor on the bottom and was riding back out on his belly to avoid paddling, as a session extender. I have read about one guy who did this some years ago to be able to continue surfing after a heart attack. He had a pressure switch on the deck below his chest that stopped the motor when there was no more pressure on it, when standing up. The old guy longboarding here seemed to be similar. He had a wrist remote, he would motor out, paddle into the waves by arm power I think. He said he was doing this to lengthen his session ... not so much a replacement for paddling, more a supplement (kind of like how people use e-bikes I guess). But I think the motor must have had drag on the bottom of the board. 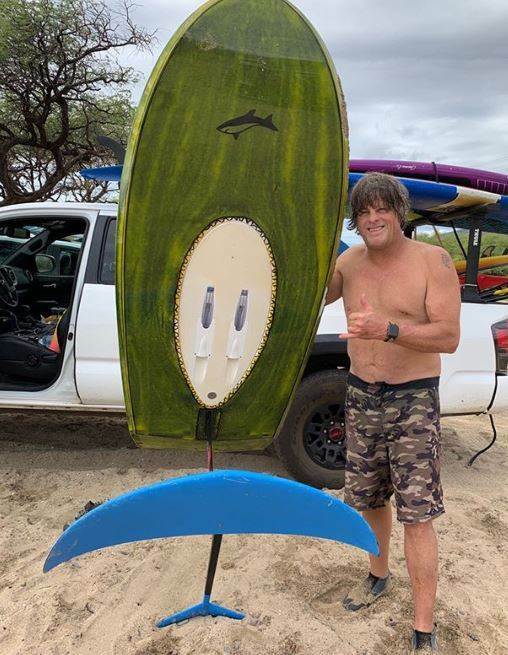 He was surfing a non-critical wave, the soft sup wave, I suspect it wouldn't perform well on the faster down the line waves. Though with an embedded jet motor, there's be very little drag too.